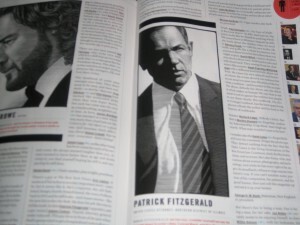 Chicago U.S. Attorney Patrick Fitzgerald, one of the better known federal prosecutors in the nation, has traditionally grabbed headlines for going after bad guys. But this time, the 49-year-old is grabbing headlines for something far more personal: His wife Jennifer Letzkus, a Chicago teacher, gave birth to a baby boy Conor Patrick Fitzgerald on Dec. 21, according to the Chicago Tribune. “Everyone is happy and healthy,” spokesman Randall Samborn told the Trib. The couple was married in 2008. Posted: 1/4/10 at 4:25 PM under News Story.